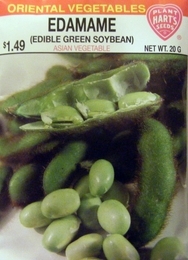 Green vegetable soybeans, a staple in eastern Asia, have become popular world-wide for both their unique taste and the nutritional powerhouse contained in each bean. Acclaimed in taste tests as the finest of the green soybean for their sweet buttery flavor. Well branched 2-2 1/2 foot plants produce prolific sets of pods with tan pubescent most containing 3 large beans. Soybeans are nitrogen fixing (legumes) and they require little fertilization but will benefit from adding inoculant at planting. Pods should be harvested when they just start to lose their bright green color.